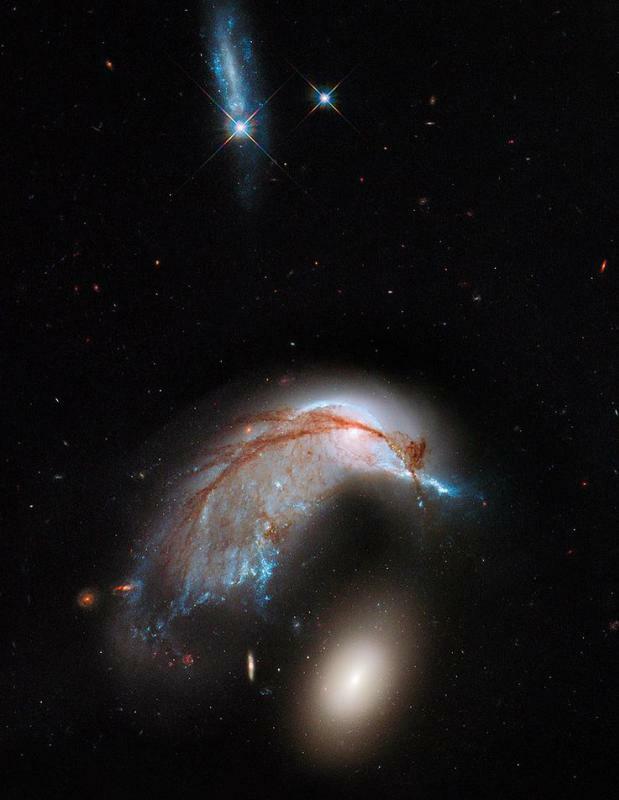 A minority of the galaxies in the universe are irregular galaxies, which have irregular shapes or structures, and no symmetry in their rotation. The intergalactic medium connects galaxies together like a game of connect-the-dots. 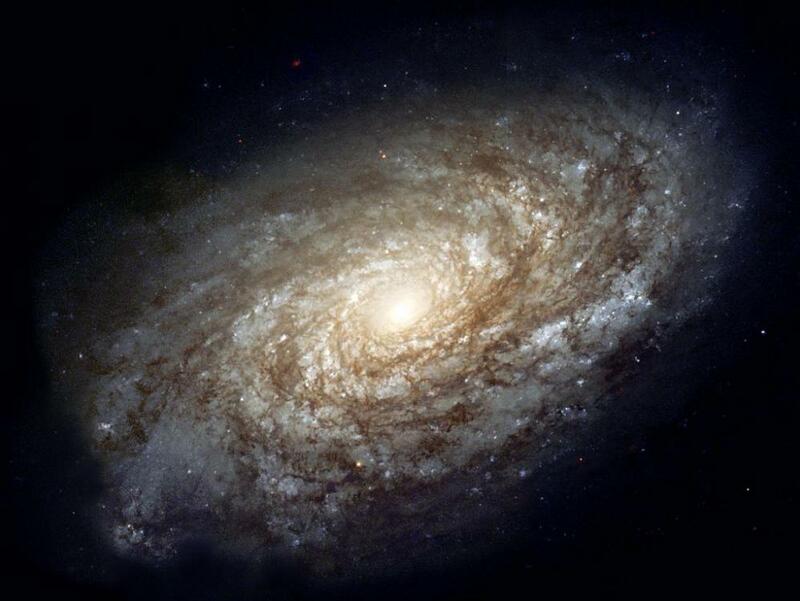 The intergalactic medium (IGM) is a sparse gas that extends between the galaxies of the universe. It takes on a cosmic filamentary structure, with thin wisps and walls separating vast void areas. The intergalactic medium connects galaxies together like a game of connect-the-dots. The intergalactic medium is quadrillions of times more sparse than so-called thin air. Scientists estimate the average density of the universe as a whole to be about one hydrogen atom per cubic meter, with the intergalactic medium having about 10 to 100 atoms per cubic meter. To put this into perspective: if you gathered all the matter from a volume of intergalactic medium about as large as the Earth, you would end up with matter equal to a small ball bearing. The majority of the universe is also quite cold: 2.73 Kelvin. This heat is residual from the Big Bang. The intergalactic medium is also filled with a highly homogeneous spectrum of radiation called the cosmic microwave background. Its existence was used to support Big Bang theory. The intergalactic medium, the filamentary structure between the galaxies, is very much hotter than the average temperature of the universe: on the order of 100 thousand to 10 million Kelvin. This is because gas heats up as it falls into the intergalactic medium from the huge voids surrounding it. This temperature is enough to ionize, or strip electrons from nuclei, thus the main constituent of the intergalactic medium is ionized hydrogen. Physicists call this the Warm-Hot Intergalactic Medium. In certain areas near the intersections of cosmic filaments, the gas temperature approaches 100 million Kelvin. Although this sounds like a lot, it wouldn’t feel very hot if you were standing in it, because the atoms making it up are so sparse. An especially condensed area of the intergalactic medium is known as an intracluster medium, because it lies in the middle of galaxy clusters. The intracluster medium radiates x-rays which can be observed with a telescope. Because the universe is expanding at an accelerating rate, the whole thing gets sparser as time goes on. Eventually, perhaps in a few hundred billion years or maybe longer, it will expand so quickly that our galaxy and everything in it will be completely torn apart. What are the Health Effects of Cosmic Rays on the Human Body? What is an Ultra-High Energy Cosmic Ray? What is a Stellar Stream? What is the Sagittarius Dwarf Elliptical Galaxy? anon38221 - You aren't taking the areas of void into account. You're right that IGM is of lower density than galaxies, but the average density oof the universe isn't just galaxies + IGM, it's galaxies (etc) + IGM + areas of void. The inclusion of these areas of void reduce the average density of the universe to below the average density of IGM alone. The sentence, "Scientists estimate the average density of the universe as a whole to be about one hydrogen atom per cubic meter, with the intergalactic medium having about 10 to 100 atoms per cubic meter", is self-inconsistent. Clearly galaxies are more dense than the intergalactic medium, so if the IG is that dense, the average will not be less.